With rates as low as $7.40 per day, this parking lot is ultra-competitive and provides real value for LAX travelers. 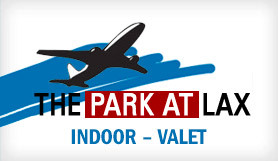 The Park at LAX is a family run business, with over 35 years experience in airport parking. It’s a valet service, just minutes from LAX airport located on the interchange where the 405 and 105 cross. The free shuttle runs every 10 minutes and take just 5-10 minutes. The shuttle is available 24 hours a day / 7 days a week. This is a valet service meaning your car is parked for you. Other services are available, just ask in reception - Simple Hand Wash, Deluxe Hand Wash, Exterior Detail, Interior Detail, Complete Detail, Engine Cleaning, Gas Fill Up, Oil Change. Please print your reservation voucher and take it with you on your day of travel. For larger vans, SUVs, and trucks, an additional $1 per day will be added to the price. Pull up outside the reception and the friendly staff will be on hand to meet you. You'll hand over your key and your car will be parked for you in the secure parking lot. Then you're free to relax, get on the bus and enjoy the short ride to the airport terminals. When you return, collect your luggage and head for the bus stop outside arrivals. The bus will be there promptly to collect you and take you back to the lot where your car will be ready for your onward journey. Take Imperial Highway exit west.